3. A methodical use of space. Not only was the tour below developed for those with an affinity for Mid-Century Modern architecture, but it was also developed to promote the education and appreciation of this newly historic architectural style by the local community. Learn about the style by experiencing Hammond's many Modern building in person! In new and rapidly developing post-WWII cities like Palm Springs, California the Mid-Century Modern style proliferated easily. However, in an older state like Louisiana, that same housing boom yielded a rise in suburban living, but not the same amount of high style Modern architecture. That is why Hammond stands out among its contemporaries. The density of local Modern architecture is rare. Pictured here, third from the left, John J. Desmond's architecture embodied the quintessential Modern style. His buildings focus on geometry and horizontality. He also included features particular to the region such as pitched roofs (to shield structures from the rain) and deep roof overhangs (to allow for shade and to create a breezeway). Compare his residences with his former boss and architectural contemporary in Louisiana A. Hays Town. A. Hays Town's style was Regional Classical Revival rather than Mid-Century Modern. Town employed visuals cohesive with the existing environment. See in the photos to the right and compare them to Desmond's work. That density is thanks in large part to the local architect, the late John J. Desmond. Born in Denver, CO John Desmond graduated Hammond High School in 1937. He went to Southeastern before transferring to Tulane University, where he received his architecture degree. After then earning a masters at M.I.T. and working for one of the premiere Modern architecture firms in New York (Skidmore, Owings & Merrill), Desmond returned to Louisiana to work for A. Hays Town in Baton Rouge. A. Hays Town was a prominent mid-century architect with a classical style. Desmond, more in tune with the Mid-Century Modern subtler sub-category called “New Formalism” than Town’s classical references, moved back to Hammond in 1952 to open his own architectural firm. Desmond’s architectural influence is still felt in the community and, due in large part to his Hammond tenure, we have a truly unique portfolio of Mid-Century Modern architecture worthy of national recognition. These structures can be spotted exposing structural elements as decoration, originating “open concept” interior design, having a low, horizontal building emphasis, and using materials that were new technology in post-WWII America - like wood paneling, concrete slab, and large sheets of glass. 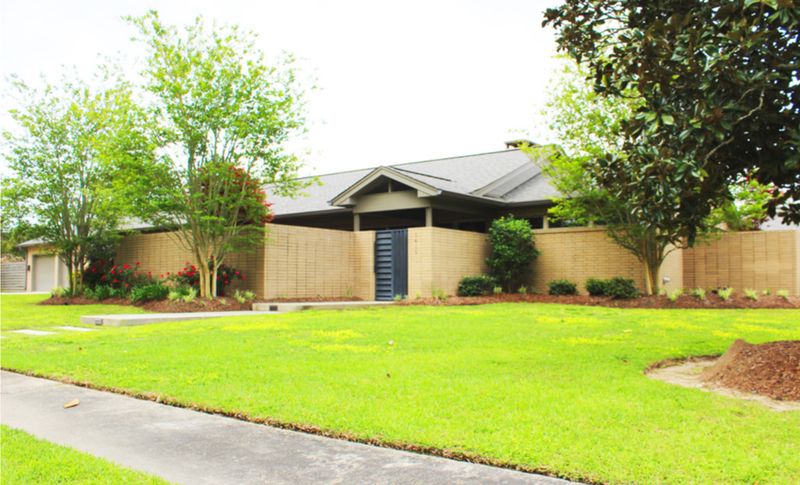 What makes Desmond’s work particularly notable is that he adapted Mid-Century Modern trends to Southern Louisiana by incorporating features and materials popular in regional architecture. Desmond’s early career Hammond buildings can be described as “Acadian Modernism” because Desmond expertly fused Acadian design elements with the clean lines and broad forms of Modernism in his residential and commercial architecture. Two of Desmond’s buildings were listed on the National Register of Historic Places in 2017 - The Miller Memorial Library and the First Christian Church - both featured below. This walking tour seeks to continue preserving Hammond’s Modern legacy through similar recognition. *Please remember that these buildings are private property and be respectful of homeowners' privacy. Enjoy the Modern architecture around you - in Hammond and elsewhere - and help us promote its importance as an historic national movement! The entire First Christian Church complex and the Reimer’s Auditorium were designed by John Desmond. they have many notable decorative features in the modern mode. One of Desmond’s most high style works, this building was put on the National register of historic places in 2017.
originally called "Hammond plaza," the downtown development district office was built to open up this green space by the railroad and provide a cohesive viewing opportunity for those paying homage to the stewart monument. This structure was built as an office for Dr. C.D. Alford. You may notice certain design elements that were for patient privacy such as the slate marble window inserts. Even though this architectural style encouraged a connection between interior and exterior, the building's function necessitated less window space. Therefore desmond added other connectors between building and environment such as the break in roof coverage over a small courtyard on the northeast corner of the building. at one time a furniture store, the building was recently renovated as a restaurant . The Miller memorial library stands almost completely as it was built with all modern design features intact except for the original steel screens flanking the front entrance. The structure was built in honor of carrie norton miller, whose estate funded its construction. the library's land was donated to the city of hammond in 1938 specifically to provide a lot for a public library. Behind the miller memorial library is the building that john desmond designed to house his office. it, like the library, is also predominantly intact. The only major exterior renovation was the addition of a pitched roof. The Mid-Century Modern style incorporated the flat roof into designs, but over time buildings in this region had to adjust because of heavy rainfall. Built for Virginia Langston, who was older and needed a smaller home for daily life. Her original house was the two story one immediately north of 408 N. Pine, which was converted into 2 apartments when she moved into the Pine residence. Upon this building's completion in 1961 it received a national design award. it remains an outstanding work of the "new formalism" architectural style with its geometry and integration of interior and exterior elements. Because the St. Albert Catholic Student Center is an outstanding example of designing for a whole site, it was placed on the National Register of Historic Places in 2017. This home was designed to be significantly connected with its natural surroundings - a characteristic John Desmond feature. While the current owners have modernized the interior, the exterior maintains the Mid-Century Modern character defining features of privacy from the street and an openness to nature at the back. Not only does this house check off many Mid-Century Modern New Formalist-ic norms with its horizontality, integrated carport, and decorative ironwork on the door surround, but what makes the Locascio house unique among its contemporaries is the break in the roofline to allow space for a tree. Rarely in Desmond’s local work is that connection between landscape and home so visible from the street. The exterior has been renovated over time to include personal design touches but still holds true to Mid-Century Modern features such as the low pitched, angular roof, the clerestory windows in the front gable, and a non-street facing main entrance. Exposed rafter tails also were common to the style by revealing structural components for decorative purposes. 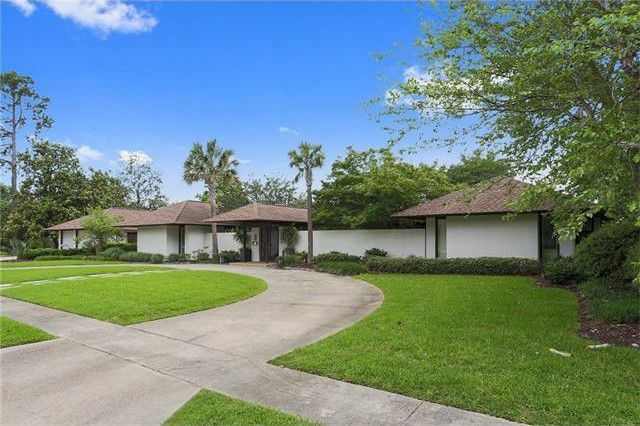 Built for C. Gallaher, the current owners have maintained the Mid-Century residence’s character defining features including terrazzo flooring throughout, two large hearths (evidenced on the exerior by the notable chimney tops), and a rear courtyard. This home holds true to many of Desmond’s stylistic associations on the exterior – i.e. the prominent hearth visible via the chimney and the low, horizontal nature of the structure. Originally built for John Desmond himself and his wife at the time, Blanche, the residence was heavily featured in national architectural publications, including the book Houses Architects Build for Themselves. The home is frequently cited as an excellent example of the Marcel Breuer “bifurcated plan.” The house is a series of pavilions and although the interior has seen much renovation, the individual, angular pavilions and the glass curtain walls that connect inside life with backyard nature remain the character defining features of the home. This house was built for Mr. Walter Antin’s parents because this location was at the end of Antin’s backyard. Antin’s own home was a Mid-Century residence on Idaho Street designed by John Blitch. It is now demolished. This house, built for I.D. Pittman, is more in the mode of Desmond’s contemporary and former boss, A. Hays Town. This divergence from Desmond’s signature style was a specific request from the Pittmans. The house serves as an example of the steady taste for traditional revivals in American architecture happening parallel to the Modern movement. Two-thirds of this structure are the original "acadian pods" designed by desmond. a 21st-century renovation added another wing onto the home, which used the same materials and echoed the same design as the original portions of the house. despite the closed nature of the design from the street, on the interior the home is seamlessly open to a rear yard. One of desmond's most high style and intact residential structures in hammond, the stetzel house has been sensitively maintained over time. its openness to the rear yard, clerestory windows, and horizontal, geometric emphasis make it a standout in the category of mid-century modern architecture. the current owners added a wing on the rear, however it is completely if a future owner wanted to completely restore the home.